Tomoe’s been sick. Last Friday, she had a fever of 38.4 degrees. We decided to cancel her nursery on Saturday, because they won’t take her if her fever is over 37.5 degrees. So, we got a babysitter. Unfortunately, a babysitter is expensive. We don’t want to do that often. The babysitter stayed at our apartment, and she seemed pretty good. She was very kind, asked a lot of questions, and seemed to enjoy her time with Tomoe. On Sunday, her fever was gone, and she could go to the nursery. She was fine on Monday, too. Tuesday is my wife’s day off, so she stayed home. Wednesday was another story. Yesterday morning, Tomoe had a fever of 38.3. We immediately emailed the nursery to tell them that she wasn’t coming. We got an appointment with a clinic in Yamato that also has a nursery. I took Tomoe to the clinic, the doctor checked her quickly, gave me a prescription, and then I brought her up to the nursery. They asked me to get the medicine from a pharmacy, which I did. When I went back, I gave them the medicine, then I had more than 2 hours to kill before work. What I liked about the nursery is that it’s much cheaper than the babysitter, and they provided me with a website, username and password. I could actually control the camera in the nursery to watch Tomoe. I did see her playing around a bit, then taking a nap. Today, I’m at home with Tomoe, taking care of her. I hope she’ll feel better on Saturday. Tomoe has caught a cold. This morning, she woke up with a 38.5 degree fever, and it’s gone down just a bit to 38.2. We went to Yamato today to visit a clinic and have Tomoe checked out by a doctor. That clinic is also an alternative day care for when she’s sick, but only on weekdays. If she’s sick on the weekend, we need a babysitter. She got some medicine, including one that should help her fever. If she has no fever tomorrow, she can go to her regular nursery. The medicine also makes her incredibly drowsy. She fell asleep very quickly. In addition to going to the clinic, we visited Yamato Park, which is near Yamato Station. 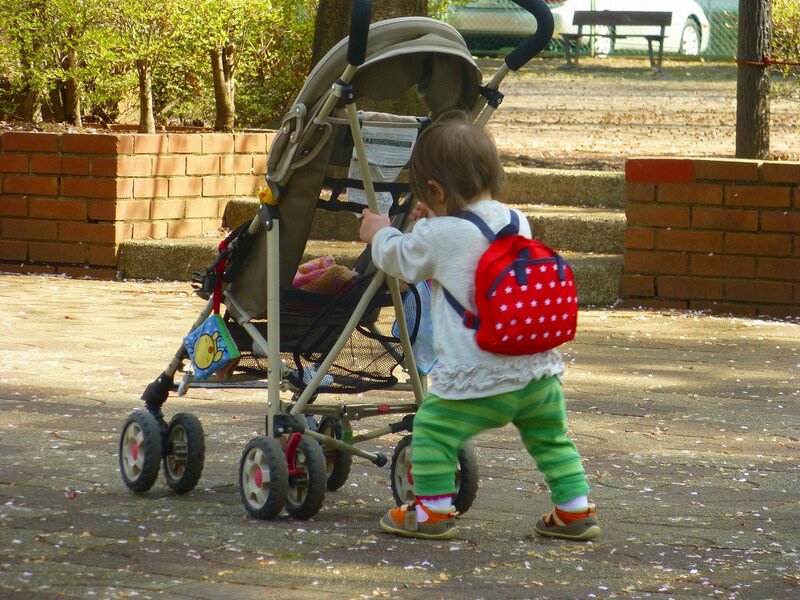 Tomoe walked around the park a lot, including pushing her stroller and trying some steps. Well, she sure gave us a surprise. This was surprise number one for the day. She climbed the steps by her self! She didn’t need any help going up, but she still can’t go down. She loves pushing her stroller around. But I need help going down the steps. I don’t want to go down, I want to go up! This wasn’t the only surprise. After we arrived home, she walked around the living room and went for her big bottle of tea. It has a straw in it, but the cover was closed. She picked it up and gave it to me. She wanted a drink, so I opened it for her, and she took a drink. It surprised me a lot. She’s beginning to figure out things like that. The third surprise happened only a few minutes later. Her formula bottle was on the floor, and she found the cap for it. She picked it up and went over to her bottle, then put the cap on the bottle. She knew where it went. She’d never done this before. She’s understanding how things fit together, how to get what she wants, and more. To top it all off, she’s been pointing at things that she wants. Yesterday, she kept pointing at some plants. She just wanted to touch them. She was so happy when she touched them. Even though Tomoe is sick, she still seems to have a lot of energy. She’s actually been in a very good mood today. I just hope she gets over her cold soon. 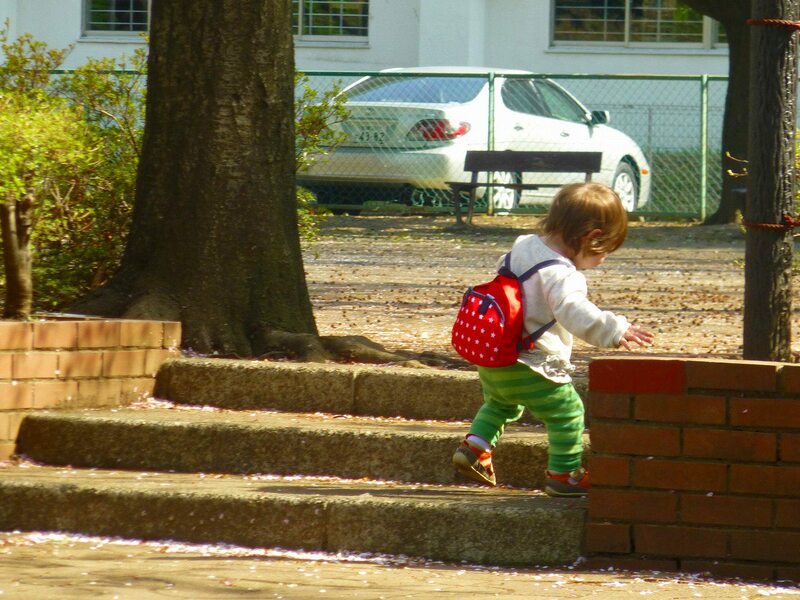 My wife has begun a new job, which means that Tomoe has to spend the day at a nursery. This is a really big step for her. Last week, she went for a day while my wife went to her job interview. She loved it there, and was quite happy. Then she cried when she came home. I guess it was very exciting for her. 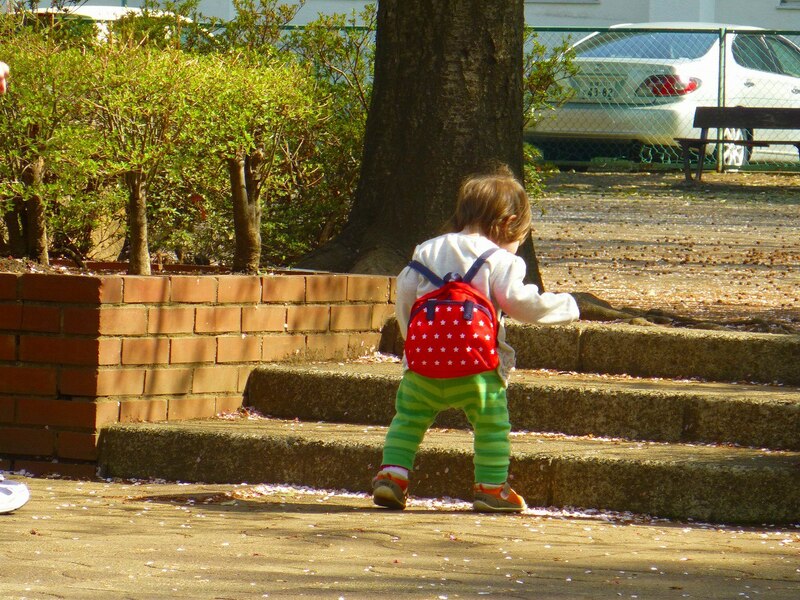 My wife has said to me that the attitude in Japan toward children being left in a nursery is the equivalent of saying, “Awww, poor kid.” It’s not that way at all! There are some great benefits for both Tomoe and us. 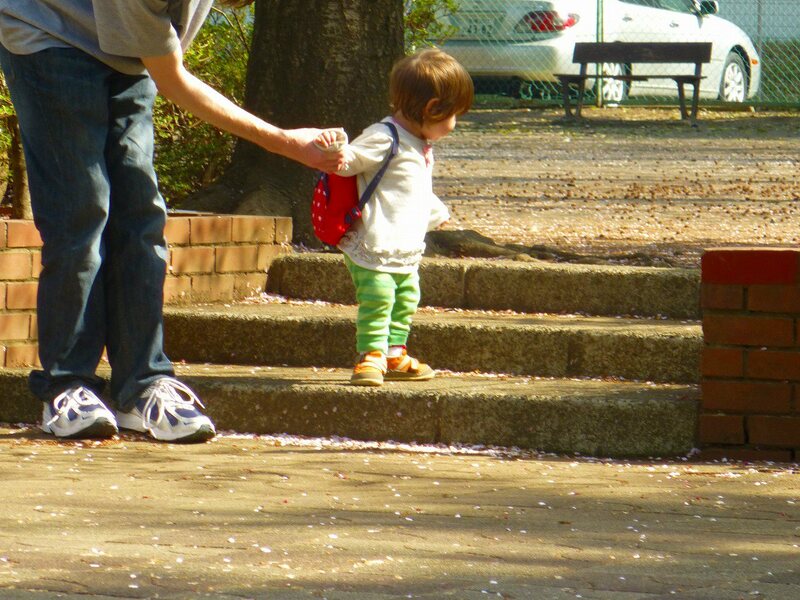 For Tomoe, she can meet other kids her age 5 days a week. She can learn and gain social skills that we can’t teach her at home. She needs to interact with others outside our family. It should help her get over separation anxiety. She doesn’t exhibit shyness much at all, so that’s not a problem. One drawback is that her English development will be slow. She’ll likely speak more Japanese than English later this year. As for my wife, she can finally have something to do other than staying home and taking care of Tomoe. I’ve heard the same comment from many mothers of babies and toddlers, they’re bored. My wife is the same. She needs something to do, and she needs to be able to spend some time away from Tomoe. My life changes a bit, too. Once a week, I have to take her to the nursery because of a different schedule for only that one day. I also have more free time while both my wife and Tomoe are out before I go to work. It’ll give me the opportunity to work on my blogs and writing during the daytime when I’m more awake. One amazing thing about this nursery is that it’s 24 hours. They take care of kids overnight, too. I’d never heard of that before. Absolutely invaluable for those of us with evening jobs. In other news, Tomoe continues to be extremely mobile. She’s nearly able to run now. She loves walking around the apartment carrying things with her. She loves playing with forks and spoons, often hitting them on plates and in bowls. She’s learning how to use them, though she can’t feed herself yet. She also understands that some things fit together, like velcro and keys with keyholes. She’s always trying to press the button on my iPhone, as well. Communication continues to develop, as well. She doesn’t speak in anything we recognise as words yet, but she understands more and more all the time. When we say, “night night” to her, she starts crying. She doesn’t want to go to bed. She’ll come when we say, “come here.” When I say, “Can I have that, please?” she gives me what she’s holding. She does that extremely well now. Another thing that’s amazing is that she has a favourite Facebook game. Whenever I start playing Angry Birds, she gets a big smile. She loves watching the birds flying across the screen, knocking things down. She recognises the loading screen, and gets really happy. Sorry about no pictures this time. It’s been a very busy few days.